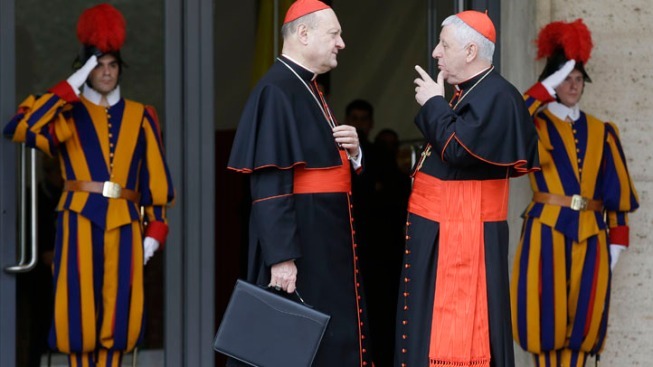 Cardinals Gianfranco Ravasi, left, and Giuseppe Versaldi share a word as they arrive for a meeting, at the Vatican, Saturday, March 9, 2013. The preliminaries over, Catholic cardinals are ready to get down to the real business of choosing a pope. A pastor in Ontario wondered about behind-the-scenes politicking ahead of the conclave to elect the next pope. He could have read news reports or listened to briefings by the Vatican spokesman. Instead, he asked a cardinal. Less than an hour later, the response arrived. "What I see is a real desire to know, and so evaluate, the papabili against criteria of qualities demanded by situations," wrote Cardinal Wilfrid Napier of Durban, South Africa, using the term "papabili" for cardinals seen as papal contenders. The exchange occurred on Twitter, one of many online interactions that have made this papal succession unlike any other for Roman Catholics and observers of the church. While the election starting Tuesday will remain strictly secret, social media is providing a direct link to the events surrounding the succession, creating a virtual conclave that involves lay people in everything from voting to prayer. "I think it's fabulous for the church," said Brother Martin Browne, a Benedictine monk in County Limerick, Ireland, who is following Vatican analysts and reporters on Twitter instead of watching general news coverage. "I think more people understand what's going on now because there's greater access to good information." No one will be posting updates from inside the Sistine Chapel. The Vatican will activate electronic jamming devices so no one can listen in or report out. "You obviously can't have cardinals inside the conclave tweeting 'Uh-oh, trending right now: new young cardinal from wherever,'" said Greg Burke, a Vatican communications adviser. But in the run-up to the ceremony, several cardinals have been interacting with the faithful on Facebook, Twitter and elsewhere — in some cases even during the interview ban the College of Cardinals imposed last week to prevent leaks about their daily meetings. Cardinal Ruben Salazar Gomez, archbishop of Bogota, Colombia, tweeted that although God would ultimately choose the next pontiff, he wanted to know what his followers hoped for in a new pope. "I would very much like your feedback," he wrote in Spanish. On zulumissions.org, a site for the Archdiocese of Durban, church officials have been providing updates for parishioners leaving messages and prayers for Napier. Along with daily meetings and informal dinners, several of the 115 cardinal-electors, some of whom had never met, say they're using Google to research each others' writings and church works. Yet, the numbers of cardinals who directly participate online is relatively small. About two dozen had Twitter accounts when Benedict XVI stepped down. Many church leaders have accounts in their name, or on behalf of their dioceses, but leave it to their communications staff to actually write Facebook posts and send tweets. Benedict used the Twitter handle (at)pontifex, but he, too, let advisers write the messages. The account has been taken down and the papal tweets saved. The more intensive activity is springing up among parishioners and the generally curious. Spotify has a conclave-themed music list. (The hymn "Ubi caritas et amor," or "Wherever charity and love are," is included.) A fan of Cardinal Luis Antonio Tagle, archbishop of Manila, posted a YouTube video of a song about why Tagle should be the next pope. (About 8,600 hits by the weekend.) Several sites saying they're trying to crowd-source the conclave by setting up their own election sites. A Twitter account recently opened with the handle (at)papalsmokestack. It has a photo of the Vatican chimney that will carry the white smoke signal alerting the world when a new pope has been elected. On"Adopt-a-Cardinal," people register an email address and in return receive the name of a cardinal to "adopt" in prayer through the conclave. The site was the work of some members of Youth 2000, a church-recognized group in Germany. Someone saw a newspaper feature with photos of all the cardinals and remarked: "Those cardinals need to be prayed for," said Ulli Heckl, who works with the organization. Volunteers created the website in German and English and drew so many responses the server briefly crashed. Others who ran across the site offered to translate it into additional languages. Soon, versions went live in Spanish, Italian and French, as well. Nearly 400,000 people had signed up days before the conclave. Heckl said she has heard from entire families who are together praying for one cardinal. Another family put a photo of the cardinal at each of their bedsides so they would remember to pray every night. Some school classrooms have also joined and are using the project to learn more about the nation the cardinal serves. People from Nicaragua, Brazil, Philippines, Ukraine and most European countries are among the participants. "We heard from so many people who said, 'It's not THE cardinals anymore, it's MY cardinal," Heckl said in a phone interview from Germany. Each week since Benedict stepped down, the team has posted winners according to the different approaches. Although all 115 cardinal-electors are eligible to become pope, the organization had to limit the number on the ballot for their experiment to just six well-known cardinals. All visitors to the site can vote. So far, the winners, depending on the electoral approach, have been either former Quebec archbishop Cardinal Marc Ouellet or Ghanaian Cardinal Peter Turkson. "I thought this is an election that will get attention around the world. This is one of the very, very few international elections, so this would be a great opportunity," Andre Blais, a specialist in electoral studies at the University of Montreal, said in a phone interview. Mary Sullivan, a 29-year-old mother of two from Burtonsville, Md., said she saw a link to "Adopt-a-Cardinal" on a friend's Facebook page and decided to join. By chance, her cardinal is considered to be one of those favored to become pontiff: Cardinal Odilo Scherer of Sao Paolo, Brazil. She hadn't heard of him before. Nonetheless, Sullivan said she and her husband have added Scherer to their daily rosary prayer. She also sent the link to the mother's group at her local parish and shared it on her Facebook page. "The cardinals have a huge task ahead of them, I know they're getting pressure from all sides, and hearing noise from all corners of the globe," Sullivan said. "We pray for them so they can listen to the most important voice, and that is the Holy Spirit."